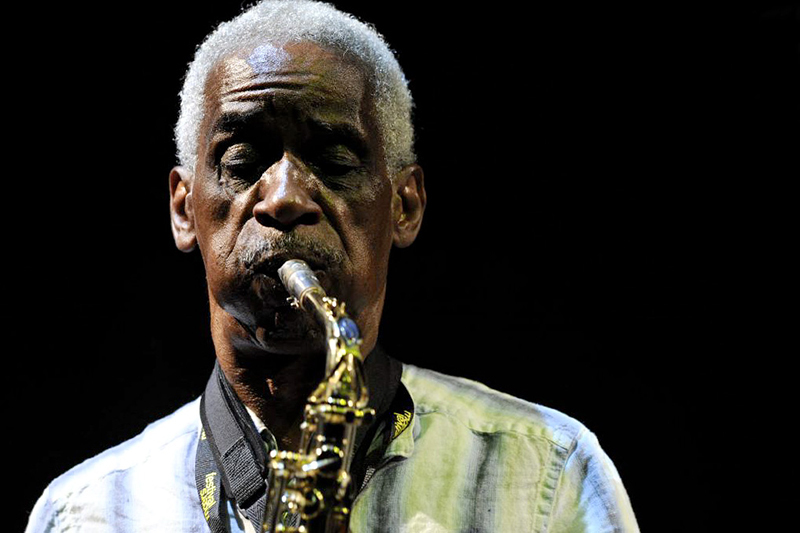 Roscoe Mitchell performing at the Moers Festival in Moers, Germany, 2009. Photo: Michael Hoefner. License: Creative Commons Attribution-Share Alike 3.0 Unported. Phillip Greenlief: I have to start by thanking you. About ten years back I mentioned that I was always planning my solo concerts and I just felt that wasn’t improvising, and you said, “Well, try planning half as much.” So the next time I had a solo concert I kept waiting to plan and kept putting it off until the day of the show — and then I didn’t plan anything, and it was one of the best shows I had played up to that date. Roscoe Mitchell: Yes, you have to listen and plan this in real time, you know? And it was interesting being out this time, working with the band and trying to figure out how to get people so they’re actually doing that — so that you’re not only building things on your own, you’re able to build things with other people, because of a knowledge of how they’re putting their music together. There was one moment on tour when a trill was in the air, and so there was the opportunity to really explore all the elements of what a trill can do. That kind of research and working together, it helps me in my composing and it helps me in my improvisation; there’s just so many different facets of it. PG: Yes. Another thing you said — not resisting if you find yourself in an uncomfortable place — has a great deal of wisdom: maybe it’s a new door that you’ve gone through and you want to explore what’s on the other side of that door. You’re going to find something there that becomes part of your palette, becomes part of your sound language, becomes part of your music. RM: That’s absolutely true. On this tour, we’ve worked on the thing where we say, “Okay yeah, we’re going to start off here and we’re going to improvise for a half an hour. The first thing in, we’ll try to maybe sound like we’re in nature, organic and so on, using space and small sounds.” So we worked on that for a bit and then I finally said something similar to what you just said: “You know, let’s just go out there and see what’s in the air tonight.” Because from my own experience, I find sometimes I don’t fare that well if I did something good one night and then I go back out the next time and try to do the same thing. But if I’m aware of what the night is offering, I fare better. And it is like you’re saying — opening up a new door. PG: I’ve seen quite a few of your compositions; you tend to use traditional notation, is that true? Is there also work that you’ve done where you’ve invented notation systems or, let’s say, you were just on this tour and you’ll just make a suggestion with some words? But it seems like traditional notation is your mode of working on the page. RM: Well, not entirely. If you think about my ambient pieces and so on, I have a lot of things in there that are not traditional. My rule for that is if I’m going to step outside of the system that we have — which really does communicate — I need to measure up. I need to make sure I’ve got something that can communicate so that if I’m not around, you might still be able to play my music. So I work at different methods that can help people get a grasp on that. If I think about improvisation, I think about the elements that are in there and what makes it a success and what does not make it a success and then I go after the parts that are not successful and try to figure out a way of bringing that to the attention of inexperienced improvisers. A lot of times, with inexperienced improvisers, the problem that they’re having is not knowing what to play. So I’m creating the situation that gives them materials that they’re going to be playing, but gives them the option of moving these materials around the way they want to move them. That’s not a bad place to be in an improvisation: you’ve got your materials, you know what it is you’re going to be doing. And it gives inexperienced improvisers the possibility of remaining in real time inside of the improvisation, for longer periods of time. That helps with development later on. PG: I find another problem that arises with younger improvisers is they can posit an idea, but then they pull back and they don’t develop the idea. We’re at Mills College, and you’ve been teaching here for a long time. I realize you’re a professor of Composition, but I have to imagine you talk about improvisation with your students as well. These two things are two sides of the same coin, right? RM: Absolutely. They are. I advise students to study composition and improvisation as parallels. So definitely I talk about these different kinds of questions. I think that improvisation is no different from any other music; you always need to be able to rehearse whatever it is that you’re doing. So say you’re working on something and it’s not quite going the way that you want it to go. You just stop and say, “Okay, I’m going to go back to that.” It may not be exactly the same, it might be in that same area of study, and you work it out ‘til you get it sounding like you want it to sound. These developments are close-knit with composition. PG: How do you teach development? This is an area that I find difficult for students to get past. They think of an idea [vocalizes a simple melody], but how do you sustain that for more than a minute? RM: That’s right. Well, there’s many different ways, like what you were just saying. You can change the duration of all those pitches, that’s one way. You can change the way it’s phrased, the dynamic structure. What you sang is enough material to really do a lot with. Because you’ve got all these different elements and if you’re doing it with someone else, you’re not stuck in a place where there’s only one option, and you can’t go anywhere with that. That’s the way to get the development going, by looking at every side of the problem and gradually picking it apart and developing all these different parts of it. That way you gain extension. I always like to keep a timer with me; if I was doing something for ten minutes and I want to extend it to fifteen or twenty minutes, I know that I can go to that. If I’m not doing it in real time, then I don’t really know what I’m talking about. RM: That’s right, that’s right. PG: So really it’s the same concerns that Haydn or Beethoven had, in terms of variation. Thinking about those elements — elongating a phrase, changing the pitch, putting the music in a different meter — all these things that composers have been dealing with for all these years. They haven’t gone away. 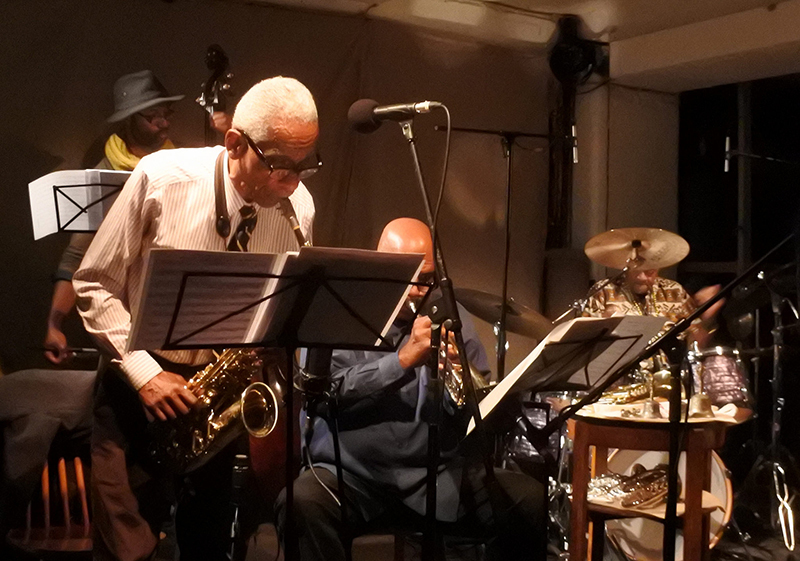 Art Ensemble of Chicago performing at Café Oto, London, 15 October 2017. From left to right: Junius Paul, Roscoe Mitchell, Hugh Ragin, Don Moye. Photo: Luke McKernan. License: Creative Commons Attribution-ShareAlike 2.0 Generic. PG: You work in the tonal system and your music also has a really rich sound language. Sounds that don’t fit into the tonal system. Of course, everything has a vibration, everything has a pitch. A bell has a pitch. Is there a political aspect to this, or is it all just different colors you can paint with? RM: Well, David Wessel had the first computer music conference in the United States — this had to be shortly after I got back from Europe, with the Art Ensemble. RM: Yeah, in that period. And then he later went onto IRCAM [Institute for Research and Coordination in Acoustics/Music] to work for Pierre Boulez. David was very excited about the work with the computer and wanted me to come over to his house. He said he’d been up all night and I went over there, and he was playing one note for me and I said, “David, I’m going to try to keep up with you on the saxophone.” It goes back to that. And my study of opposites, of being able to be in the chromatic system and being able to be out. There’s a lot of stuff waiting around to be developed, I’m telling you. I’m having fun making these discoveries right now. And wanting to even have more time to explore. For example, Ilan Volkov invited me to premiere a piece with the BBC Scottish Symphony Orchestra in Glasgow, Scotland. And that’s where I premiered the version of “NONAAH” for full orchestra. Then later on he invited me to come to Reykjavik with the Iceland Symphony Orchestra. I didn’t want to go back there with the same piece that I had in Scotland, so I got this idea of finding people that would help me transcribe some of my improvisations, both from my solo CD Sustain and Run and my trio CDs Conversations I and II with Kikanju Baku and Craig Taborn. The first person I asked was Paul Steinbeck. Do you know Paul Steinbeck? He was a student of George Lewis, and he just recently wrote a book on the Art Ensemble of Chicago called Message to Our Folks. Paul put me in touch with several people who were interested in making transcriptions of these improvisations. And what this is for me is an ongoing process of developing an improvisation. If I say, “Phillip, I’d like you to come and be the soloist on this piece,” it’s like I’m saying, “Phillip, I want you to come and improvise with Craig Taborn, Kikanju Baku, and myself.” So the process starts to grow. In some cases, I’ve taken one piece and made two out of it. For instance, “They Rode for Them” was originally a piece for bass saxophone and drum set. In the first orchestration, I used a drum set to create the orchestration for the orchestra. I took myself off of bass saxophone and reinserted myself on sopranino as an improviser. The following month I had a performance in New York where I used the bass saxophone part to create an orchestration that features Sara Schoenbeck on bassoon as soloist. So you see, it’s always growing. This piece that I’m writing now was about seven minutes in length and the Ensemble InterContemporain requested a piece for twenty minutes. So I’ve taken that material and developed it into all of these different variations, so it fills out the duration that they’re asking for. This is an ongoing thing that I’m really excited about — having the opportunity to both study it by writing it and also from actually playing it. PG: You’ve been here eleven years at Mills. And this is your last semester, is that right? PG: You’re going to finish the academic year out. I’m glad to hear that. What’s the biggest challenge you face when teaching students? RM: Sometimes I look at the students’ portfolios and I’m always amazed at how much work these people are getting done. I think, “Wait a minute, I’m in the wrong business here. I need to be a student.” So yeah, that’s great. I’m inspired by my students. PG: Do you mind if I ask you to talk a little bit about being in Chicago in the late ’50s? You were at Wilson College with Malachi and Jarman and Braxton and Threadgill and — what was in the water? I mean, you guys came out of this community college and changed the face of jazz. Do you remember what you were thinking about and talking about in those days? What you wanted to do? RM: When I got back from the army, you know, most people in Chicago were probably a bit more advanced than I was. I had heard Ornette Coleman when I was in the army and met Albert Ayler, but when I got back, it was Coltrane’s record that started to open me up a little bit — on the album Coltrane, where he was using modal concepts to create improvisation. Then I started to go back to listen to Ornette and Ayler and all of these people, and it started to become clearer to me. I was lucky to be in a place where you’ve got a lot of people with a similar vision about music in mind, you know? And that are willing to stick with it. I mean that’s what I get out of the early days in Chicago. And here we are: 2015 was the fiftieth anniversary of the AACM, and 2019 is the fiftieth anniversary of the Art Ensemble of Chicago. I think for me, it’s really going take a long time to get to the point that I’m trying to get to in music. And it’s nice to have this momentum, to want to pursue and study like that. Perhaps if someone had said to me a long time ago, “You know, this thing never stops” — I don’t know how I would have felt about it. But now I see that there’s no lack of things to do. RM: On no front at all, on no front at all. 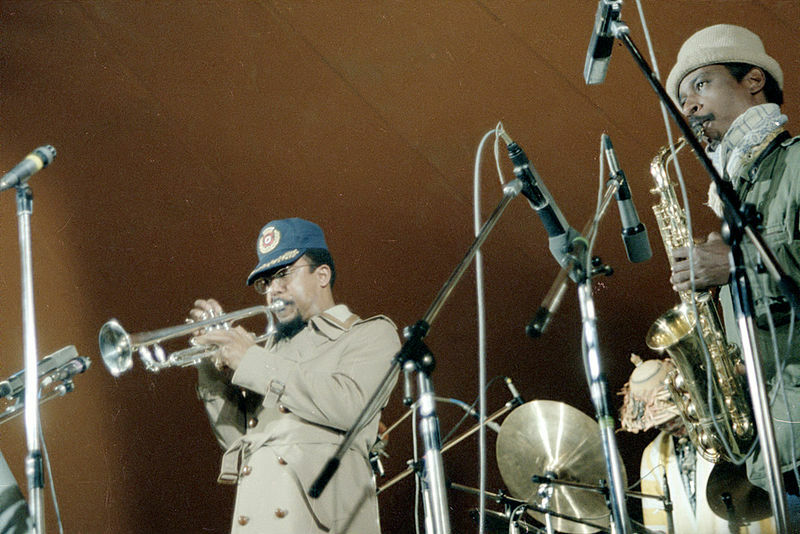 Art Ensemble of Chicago performing at the New Jazz Festival Moers, 1978. From left to right: Lester Bowie, Don Moye, Roscoe Mitchell. License: Creative Commons Attribution-Share Alike 3.0 Unported. PG: Will you be teaching when you go back to Madison? You’re going back there when you leave here, is that right? RM: Well yeah, I still have my home in Fitchburg. I’m looking for a nice period of just being able to know what I’m going to be doing, just for a month or something because, well, I have been going at it. It takes me awhile to get back in it, you know what I mean? PG: Mmhm. So it’d be nice to have time to compose. RM: Oh yeah. To compose and to practice and all of that. I mean it just seems that all of a sudden, somebody turned on the busy button here. It’s like, “Whoa, man.” And then the computers — like, whoa. Everything is big, bigger than life, man. PG: Yeah, the work that’s been coming out the last couple years that you’ve produced is really extraordinary. Bells for the South Side, and also the album with The Transatlantic Art Ensemble. RM: Yeah, the one with Evan Parker. Mmhm. PG: It sounds like you’ve got a lot more stuff coming out that we don’t know about yet! And you just did this recording session in October. RM: Right, yeah I did. PG: It’s a very different group. PG: You and Mr. Moye. RM: Yeah, so that’s it. And he brings what he’s doing with African percussion, and I’m coming from another side. The makeup of the group is — of course, he and I — and then there’s Nicole Mitchell on flute and Fred Barry and Hugh Ragin on trumpets. There’s Christina Wheeler, voice and live electronics, there’s Mazz Swift, violin and voice, and Jean Cook on violin, Eddy Kwon on viola, and Tomeka Reid on cello. Silvia Bolognesi on bass, Jaribu Shahid on bass, Junius Paul on bass. Dudu Kouaté and Enoch Williamson on African percussion. It’s a world of sound. PG: I saw a couple videos from Europe of this recent tour. It’s sounding great, the music’s fantastic. What about the quartet that’s going to play The Lab? Is this a group that you’ve been working with for a while? RM: Yes — I have with Vincent Davis and Junius Paul. I first met Vincent Davis when he came with guitarist Manty Ellis to visit the class I was teaching at the University of Wisconsin-Madison in 1987. We’ve continued to play music together since then in a lot of different configurations. Junius Paul came along later. The first concert we played together was at the Constellation in a memorial concert for Fred Anderson, which became a recording on Nessa titled Celebrating Fred Anderson. This is my first concert with Ambrose Akinmusire. Recently, Nicole Mitchell told me that Ambrose was living in the Bay Area, and said she wanted to introduce me to him. I sent him an email and we got together to play some music. This concert at The Lab will be our first performance together. PG: Is it an improvised music ensemble? Are you bringing compositions into it? Or is it always both for you? RM: It’s going to be both, because Ambrose and I are out here, and there’s no excuse for us not to get together and practice. And then Vincent and Junius, they practice together every day. They’re both from Chicago. Who knows, man? If I could get up from this computer, I could get out my bass saxophone or something, man. This is my do-or-die week. I need to get the score to the ensemble about a week from now. But then the parts are not due until December, so I guess I would have that little bitty time to make final changes to the score and that kind of thing. But I’m learning so much, just about the way you mark the materials; you almost get the instruments talking. PG: You mean in the way that you’re using articulation marks [on your scores]? RM: Yeah. Like you listen to some of these old bands, too, with the mutes and things that people were doing. I mean they were talking, basically. PG: You mean like, Ellington, the early recordings on something like “East St. Louis Toodle-Oo”? PG: Yeah, those trumpet players. RM: Oh yeah, yeah. Definitely. PG: We don’t get to hear you enough here, you know? It’s been great that you’ve been here all these years. I mean, your presence is felt whether you’re out playing around or not. RM: Well, I’ve been busy out here, that’s for sure. PG: Anything else you’d like to say about being in the Bay Area? RM: Well, it’s going to probably take me a little while to get used to Wisconsin weather, you know? I went back there one time to Minneapolis and it was right in the middle of winter in December. It was for a concert with Douglas Ewart and Adam Rudolph, Yusef Lateef, and myself at the Walker Arts Center. Man, I hadn’t experienced those kinds of temperatures for a while. It was way below zero. Before I came out here, I was kind of used to it. But I can get used to it again.